Ghost stories are a dime a dozen this time of year. Lots of people are fine with that, and they’ll look at Orlando Shakespeare Theater’s The Turn of the Screw – with its looming tower, its gloomy staircase and its atmosphere of underlying evil – as more of the same. But that’s taking the shortsighted view of Henry James’ 1898 novella, which has fueled readers’ and critics’ arguments for more than a century and has been adapted by playwright Jeffrey Hatcher with all of its creepy ambivalence intact. 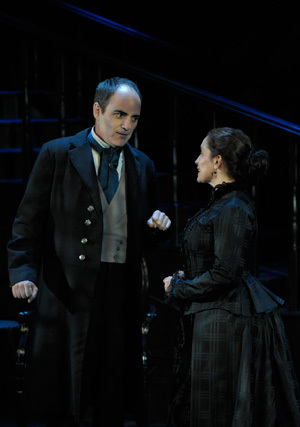 Longtime Orlando Shakespeare favorite Eric Hissom will be back in town for the theater’s production of the Henry James classic The Turn of the Screw, which also will star veteran Orlando Shakes actress Suzanne O’Donnell. For the last year or so Hissom has been traveling with the national tour of The 39 Steps.